27/06/14 -- Soycomplex: Beans closed lower, with the largest losses in the deferred months. Stats Canada estimated 2014 canola plantings at 20.2 million acres. That's 0.3 million higher than the average trade estimate, 0.4 million up on their April forecast and a 1.3% increase on the 2013 acreage of 19.9358 million acres. They also forecast the 2014 Canadian soybean area at 5.583 million acres versus an average trade estimate of 5.1 million and their April estimate of 5.2644 million. That's a 23.6% increase versus the 2013 area of 4.5189 million acres. It's not just in the US and South America where current soybean prices are grabbing farmers' attention it would seem. The Buenos Aires Grain Exchange said that the Argentine soybean harvest was 95.2% done, a 3 point rise on a week ago. They held steady with their production forecast of a record 55.5 MMT. In Monday's upcoming USDA planted acreage report the trade is looking at an average figure of 82.154 million (record high) for soybeans. The range of estimates are 80.5-84.0 million, the USDA's March estimate was 81.493 million and the 2013 acreage was 76.533 million. As far as the Jun 1 quarterly stocks report goes, trade estimates for that are in the range of around 340-440 million bushels, with the average guess centred in the region of the 380 million mark. US weather next week is seen turning drier, which will not be a problem after all the recent rains. The USDA will also report on crop progress/conditions on Monday night. The 2014 US soybean crop was 95% planted as of last Sunday night, and 72% of the crop was rated good/excellent - said to be the highest percentage in the top two categories since 1986. Funds were net sellers of an estimated 6,000 soybean contracts on the day. The weekly Commitment of Traders report shows them cutting their long holding in soybeans by 5,403 contracts taking their overall net long position down to 41,221 contracts. Are they gearing up to play beans from the short side for a change? It seems like it's been a very long time since they've done that in beans. Only time will tell. Jul 14 Soybeans closed at $14.32, down 5 cents; Nov 14 Soybeans closed at $12.28, down 16 1/4 cents; Jul 14 Soybean Meal closed at $469.80, up $4.30; Jul 14 Soybean Oil closed at 39.98, down 53 points. For the week overall Jul 14 beans were 16 1/4 cents higher, whilst Nov 14 lost 3 1/2 cents. Jul 14 meal was up $10.60 versus last Friday and Jul 14 oil fell 6 points in the course of the week. Corn: The corn market ended a little higher on the day, but lower for the week. The trading range was narrow, and there may have been some short-covering and profit-taking ahead of Monday's reports. Note that corn has staged a limit/near limit move in 4 of the last 5 years on the day of this report (and 3 of those 4 were downwards moves). The average guess for June 1 US corn stocks is 3.722 billion bushels, from within a range of estimates of 3.046-3.950 billion. That's nearly 35% higher than the June 1, 2013 corn stocks of 2.766 billion. US corn acres in 2014 are expected to come in at around 91.725 million. The range of estimates is 91.0-92.2 million, the USDA's March estimate was 91.691 million and the 2013 corn acreage was 95.365 million. Stats Canada said that the 2014 corn planted area there would total 3.119 million acres. That's below the average trade estimate of 3.3 million and down versus their April estimate of 3.3688 million and also a 15.5% cut versus the 2013 acreage of 3.6893 million. The Buenos Aires Grain Exchange estimated that the Argentine 2013/14 corn crop is now 48.6% harvested, a modest increase of only 4.2 percentage points on a week ago, and well behind last year's pace of 76.9% complete. The harvested total so far is said to be around 12 MMT, with a final production figure of 25 MMT still on the cards, that's a 7.4% drop on last season's production of 27 MMT. China sold a little under 1 MMT of the 5 MMT of corn they had on offer at their second auction of the week. That means that they offered up a total of 7.7 MMT of corn for auction this week and found buyers for only 1.4 MMT of it, an 18% success rate. The USDA's attaché office in China estimated the 2014/15 corn harvested area at 36.5 million hectares versus 36.1 million a year ago. They forecast China's 2014/15 corn crop at 220.0 MMT versus 217.7 MMT a year ago. China's 2014/15 corn import requirement is estimated at only around 3-4 MMT in 2014/15 versus 7 MMT this season. The USDA cut their corn good/excellent crop ratings by 2 percentage points last week to 74%, although the previous week's ratings were said to be the highest in 20 years. They are due to revise that estimate on Monday night, with the trade expecting perhaps another 2 point cut. Funds were estimated buyers as being net of 4,000 corn contracts on the day. The weekly Commitment of Traders report shows them cutting their length in corn by 22,104 contracts to give them a net long position of 115,176 contracts. Jul 14 Corn closed at $4.43, up 1/4 cent; Sep 14 Corn closed at $4.42 1/4, up 3 1/4 cents. For the week Jul 14 corn was 10 1/4 cents lower, with Sep 14 down 6 cents. Wheat: The wheat market closed around 3-9 cents higher across the three exchanges. As with corn, short-covering and book squaring ahead of Monday's reports may have been a motive behind some of the buying seen today. Trade estimates for Monday's upcoming US all wheat plantings are averaging out at 55.818 million acres, from within a range of estimates of 54.8-57.0 million. The USDA March estimate was 55.815 million and the 2013 final all wheat acreage was 56.156 million. For June 1 stocks, the average trade forecast is 598 million bushels. The range of estimates is 560-633 million and June 1, 2013 wheat stocks were 718 million. 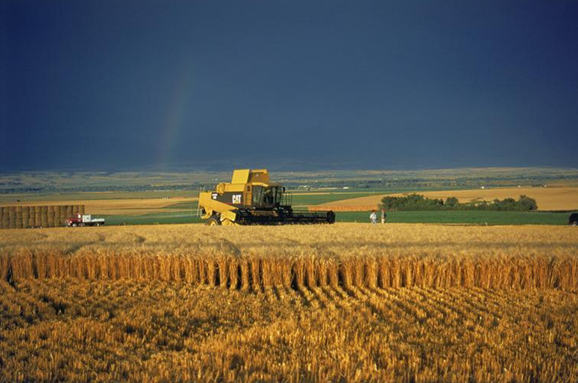 Stats Canada estimated the all wheat planted area there at 24.1 million acres, below the average trade estimate of 24.5 million and their April estimate of 24.9363 million. Plantings for last year's record crop were 26.2565 million. They forecast the Canadian 2014 barley planted area at 6.1 million acres versus an average trade estimate of 6.5 million and their April estimate of 6.3106 million. Plantings in 2013 were 7.0825 million, so this is a near 14% cut. The Buenos Aires Grain Exchange said that nationally 48.8% of the planned 4.3 million hectares of winter wheat had now been sown in Argentina. That's up 14.5 percentage points in a week, although still 4 points behind last year's pace. Oman bought 60,000 MT of Russian wheat for October shipment. Brazil were said to have bought two US HRW wheat cargoes for July shipment yesterday. The Russian Ag Minister in Crimea said that their newly acquired asset will produce a grain crop of 1.1 MMT this year, including 650 TMT of wheat. Harvesting in Crimea has already begun, with 18% of the region's early grain area already cut. Average yields are said to be 2.39 MT/ha. They are also harvesting in the Krasnodar, Stavropol and Rostov regions. Yields in the former are said to be averaging 5.3 MT/ha, and coming in at 3.3 MT/ha in the latter two. The USDA said last week that the 2014 US winter wheat crop was 33% harvested, up from 16% a week previously and 2 points more than the 5-year average. Wet weather this week may have stalled that progress a little. Winter wheat good/excellent was unchanged on the prior week at 35% last Monday, I don't expect too much change this time round either. Spring wheat rated good/excellent was 71% last week, down a point from the previous week, but one point more than a year ago. Again little change in that is expected. Funds were estimated buyers as being net of 3,000 wheat contracts on the day. The weekly Commitment of Traders report shows them adding 11,494 contracts to their net short position in CBOT wheat for the week, giving them an overall short of 40,436 lots. Jul 14 CBOT Wheat closed at $5.85 1/4, up 3 cents; Jul 14 KCBT Wheat closed at $7.26, up 5 cents; Jul 14 MGEX Wheat closed at $6.83, up 4 cents. That meant that Chicago wheat finished exactly unchanged on the week, with Kansas up 5 1/4 cents and Minneapolis losing 7 1/2 cents. 27/06/14 -- EU grains closed mixed on the day, but mostly lower for the week. Indeed it was only the increasingly erratic and thinly traded Jul 14 London wheat future (where open interest is minuscule at just 8 contracts) that managed to post weekly gains. The day ended with Jul 14 London wheat up GBP1.00/tonne (although untraded) at GBP141.00/tonne, and with new crop Nov 14 GBP0.40/tonne higher at GBP137.60/tonne. Nov 14 Paris wheat rose EUR1.00/tonne to EUR187.75/tonne, Aug 14 Paris corn was down EUR1.00/tonne to EUR172.50/tonne and Aug 14 Paris rapeseed finished EUR4.75/tonne weaker at EUR347.75/tonne. For the week that puts Jul 14 London wheat GBP1.50/tonne firmer, but Nov 14 GBP0.75/tonne lower. Nov 14 Paris wheat ended the week EUR0.50/tonne lower than it began it, whilst Aug 14 corn fell EUR3.50/tonne and Aug 14 rapeseed was down EUR5.50/tonne. Brussels confirmed that they'd issued 193,492 MT worth of EU soft wheat export licences this past week. That volume was comfortably out-stripped however by 405,801 MT worth of corn import licences. Heavy rain and flooding is said to have damaged up to 25% of Bulgaria's potential 5 MMT wheat crop. 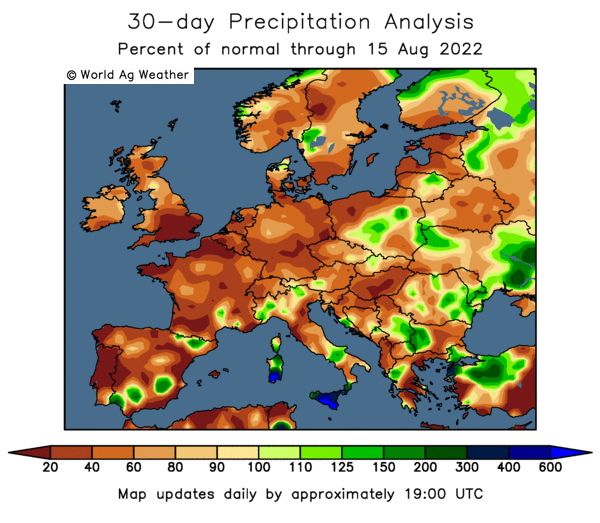 There are also said to be problems with too much rain in Romania, although this may be more detrimental to quality than yield. Earlier this week the EU Commission's MARS unit said that they had revised upwards their yield estimates for Romania "thanks to beneficial rains and favourable growing conditions". 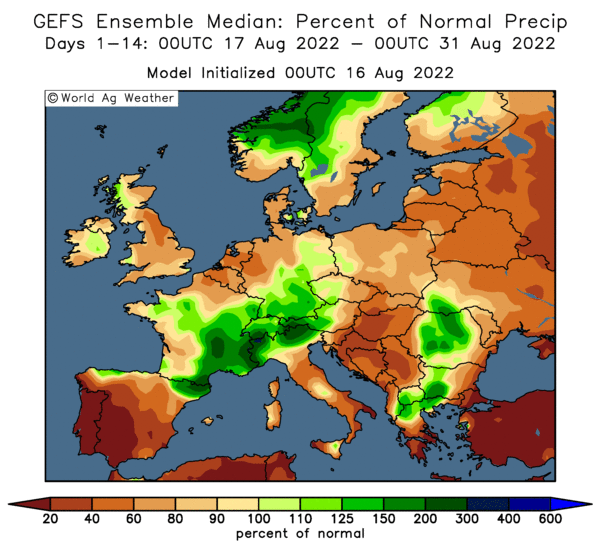 In fact, a quick scan through the MARS yield forecasts for soft wheat reveal only one country in the EU's top ten wheat producing nations where yields this year are expected to be below the 5-year average - Italy where yields are forecast down 4.3%. The remaining top nine producing countries will see yields above the 5-year average, and in all but one of those nine (excluding Spain) yields will at least 3% above the recent norm - including France and Germany. Yields in Poland are seen 6.5% above the 5-year average, Denmark is forecast 7.6% above, the UK is estimated to be 9.1% higher, whilst Bulgaria, Hungary and Romania will all see double digit gains despite their perceived weather problems. Rain makes grain, is what they say. The rapeseed harvest in the South East of France is already 90% complete, according to Cetiom. Harvesting is spreading north and west. 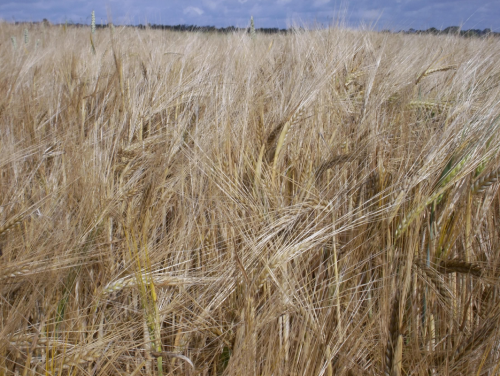 The French barley harvest is also underway at 6% done nationally, according to FranceAgriMer, and the cutting of wheat is expected to begin next week. The German wheat harvest is said to be generally around 3 weeks away. FranceAgriMer said that 97% of the French corn crop has at least 6-8 leaves visible compared to only 64% a year ago. They left their winter wheat crop condition ratings unchanged on a week ago at 70% good/very good. Winter barley rated good/very good was also unchanged on last week at 67%, as was corn at 75%, whilst spring barley ratings were cut 2 points to 64% good/very good. The early harvest in the south of Russia has produced around 2 MMT of grains so far off 536k hectares, with yields averaging 3.68 MT/ha. That's exactly the same yield as a year ago, although 1.2 million ha had been cut then, according to the Ag Ministry. Competition for export business from the Black Sea region remains fierce. Reuters report that Oman has bought 60 TMT of Russian milling wheat for October shipment at $257/tonne FOB (circa GBP151/tonne). 26/06/14 -- Soycomplex: Beans closed higher, with the best gains at the front end. Yet again, old crop export sales defied expectations, coming in at 317,200 MT with "unknown" the biggest taker. There were also net sales of 457,700 MT for 2014/15, with the largest buyers China (247,000 MT) and unknown destinations (170,000 MT). Weekly shipments were only 98,200 MT however. Not that they need to be large, accumulated shipments to date are now only 7 million bushels away from the USDA forecast for the season. Total net commitments on beans are 104% of the USDA forecast for 2013/14. The IGC forecast the world soybean crop at 300 MMT in 2014/15, up 17 MMT from this year, a 6% increase and a record volume. They said that consumption will grow 4% to 293 MMT. Ending stocks will rise from 28 MMT this season to 35 MMT next. They see record production from the US (98.9 MMT), Brazil (91 MMT) and Argentina (55 MMT) in 2014/15. They also see Chinese soybean imports rising from 68 MMT this season to a new record 71 MMT next. 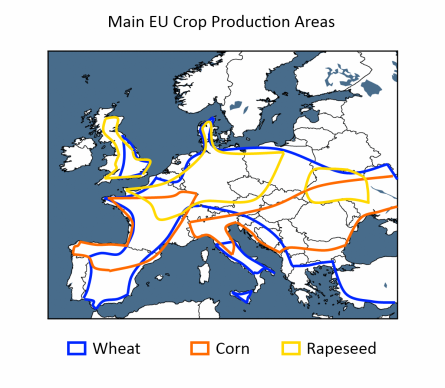 The IGC also said that "rapeseed/canola output in 2014/15 is forecast to fall by 3% from the previous year’s record, with better EU and Black Sea outturns outweighed by a smaller Canadian crop." For rapeseed next season they see a 2% increase in use and a 12% drop in end-season stocks. Trade estimates for the Monday's USDA Acreage report average 82.2 million, with Jun 1 stocks at around 380 million bushels. Before that we have Stats Canada's Acreage report tomorrow, there's some suggestion that the canola area might be up from the April forecast of 19.8 million acres due to a switch away from wheat. Jul 14 Soybeans closed at $14.37, up 21 1/4 cents; Nov 14 Soybeans closed at $12.44 1/4, up 15 1/4 cents; Jul 14 Soybean Meal closed at $465.50, up $13.80; Jul 14 Soybean Oil closed at 40.51, down 14 points. Corn: The corn market closed around 2-3 cents firmer. Weekly old crop export sales came in at 321,400 MT, along with a further 232,100 MT of new crop. Trade estimates were for 150-300 TMT of old crop and 200-300 TMT of new crop sales. Weekly shipments were in excess of 1.15 MMT. Total net commitments are now 97% of the USDA forecast for the season. There are said to be around 250 TMT of outstanding corn sales to China and a further 2 MMT or so to unknown destinations. Whether those sales will be fulfilled, switched, cancelled or carried over into 2014/15 is uncertain. The IGC forecast the 2014/15 global corn crop at 963 MMT, an 8 MMT increase on last month, although still down by 9 MMT on last year's record. The monthly increase is "mainly reflecting improved prospects in China" where production is now estimated at 220 MMT, cutting imports back to 3.5 MMT. Consumption will be 950 MMT in the year ahead, with ending stocks totalling 180 MMT versus the 172 MMT forecast previously and 167 MMT at the end of 2013/14. Dr Cordonnier said that the Mato Grosso safrinha corn harvest is 5% complete, with Parana 2% done. These are the two leading Brazilian second crop corn states. He said that IMEA were suggesting that the average yield in Mato Grosso could rise from a previous estimate of 87 sacks/ha to around 94.5 sacks/ha. The outlook for a second bumper corn crop in the state, which is far away from the ports, means that local prices dropped more than 10% last week to the equivalent of only around $3/bu. Prices in Parana are down from $4.75 in March to close to $4/bu now that the safrinha harvest has started, he added. The average guess for June 1 US corn stocks on Monday is 3.72 billion bushels, with the 2014 planted acreage number expected to be a little over 91.7 million. Stats Canada are expected to estimate corn plantings there at an average estimate of 3.236 million acres on Friday, down from a March estimate of 3.369 million. Jul 14 Corn closed at $4.42 3/4, up 1 3/4 cents; Sep 14 Corn closed at $4.39, up 3 1/4 cents. Wheat: The wheat market closed around 5 to 7 dents higher across the three exchanges. Weekly export sales of 359,400 MT were in line with trade estimates, if nothing more than routine. Buyers were a mixture of the regular Asian homes, plus other nearby destinations and Brazil (64,300 MT). Total commitments for the new 2014/15 season are around 29% of the USDA forecast, which is a bit above average. The IGC forecast the world 2014/15 wheat crop at 699 MMT, up 5 MMT from last month but still 11 MMT below last year's record. The extra production was due to increases for China, the EU and India. China's crop was raised from 120 MMT to 122 MMT, with Europe's up from 144.9 MMT to 146.8 MMT and India's increased from 95 MMT to 95.9 MMT. Russia's crop was left unchanged at 51 MMT, along with Ukraine's at 20 MMT. There were increases for wheat exports from Europe (up 0.5 MMT to 27.3 MMT), Russia (up 0.7 MMT to 17.2 MMT) and the US (up 0.5 MMT to 26.5 MMT). All of those figures are still less than each is expected to export in 2013/14 however. World wheat consumption in 2014/15 was seen close to the level of production at 697 MMT, although that's down 1 MMT from last month. World 2014/15 ending stocks were forecast 7 MMT higher than a month ago and up 2 MMT on 2013/14 at 194 MMT. Trade estimates for Monday's upcoming US all wheat plantings are averaging out at 55.818 million acres, from within a range of estimates of 54.8-57.0 million. The USDA March estimate was 55.815 million and the 2013 final all wheat acreage was 56.156 million. For June 1 stocks, the average trade forecast is 598 million bushels. Stats Canada's figures on Friday are expected to show a Canadian all wheat area of 24.5 million acres, down versus the April estimate of 24.936 million and versus the 2013 acreage of 26.257 million. Jul 14 CBOT Wheat closed at $5.82 1/4, up 6 3/4 cents; Jul 14 KCBT Wheat closed at $7.21, up 7 cents; Jul 14 MGEX Wheat closed at $6.79, up 5 1/4 cents. 26/06/14 -- EU grains markets ended the day mostly a little higher, but the impending bumper harvest is capping gains. It would be pretty unusual to see the market put in a strong rally around this time of year, without the aid of a serious weather-scare somewhere around the world, and we haven't really got one of those at the moment. The day finished with Jul 14 London wheat continuing it's erratic movements, down GBP2.00/tonne at GBP140.00/tonne, and with new crop Nov 14 London wheat GBP0.20/tonne higher at GBP137.20/tonne. Nov 14 Paris wheat ended EUR1.25/tonne firmer at EUR186.25/tonne, Aug 14 Paris corn was up EUR0.25/tonne at EUR173.50/tonne, whilst Aug 14 Paris rapeseed rose EUR0.75/tonne to EUR352.50/tonne. The Russian Ministry said that the country had harvested 350k hectares of it's 2014 crop so far, producing 1.3 MMT of grains, with early yields averaging 3.75 MT/ha. This time a year ago more than twice that area and volume had been cut. Rusagrotrans said that Russia would harvest 95.5-98.1 MMT of grains this year (the Ag Ministry currently say 96.8 MMT versus 92.4 MMT in 2013). They said that recent rains in the Central and Volga regions have improved crop conditions there, and that production could ultimately come in at the upper end of their existing range thanks to that. Elsewhere they see output in the Volga region rising from 17 MMT last year to 19.1-20.6 MMT in 2014, with production in the Urals up from 4.3 MMT to 5.1-5.4 MMT. They said however that output would fall in Siberia (from 15.3 MMT to 14.9-15.1 MMT) and the Central region (from 22.5 MMT to 20.9 MMT). Ukraine's Ag Ministry said that growers there had also harvested 1.3 MMT of grains so far this year, with yields averaging 2.76 MT/ha, a 13% rise on this time last year. MDA CropCast raised their forecast for Russian wheat (up 0.6 MMT), corn (up 0.1 MMT) and barley production (up .01 MMT) from last week due to improved weather conditions. 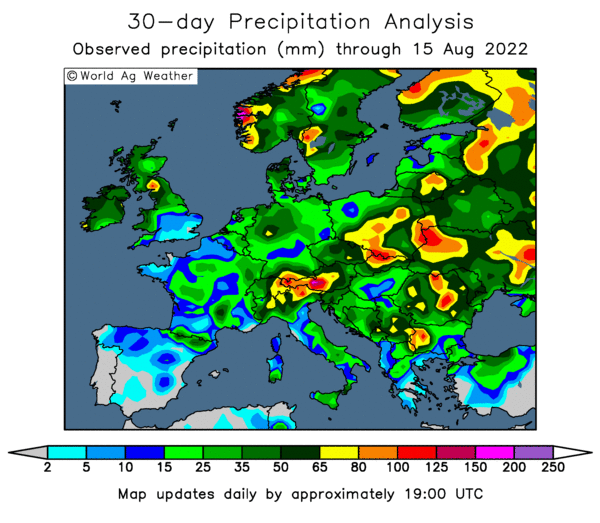 They also raised their view on European wheat (up 0.4 MMT), corn (up 0.5 MMT) and rapeseed output (up 0.58 MMT) due to rain in some of the drier areas. The trade is still bracing itself for Monday's acreage and quarterly stocks reports from the USDA. Chicago new crop corn has closed with a close to limit move in four of the last five years on the day of this report. The "usual suspects" on the Black Sea (Russia, Ukraine and Romania) are lining up to be aggressive early season wheat sellers again for the 2014/15 marketing campaign. Further west, France and Germany will be hoping to start picking up some fresh export interest themselves in the coming weeks, in the face of this stiff competition, especially once the harvest there moves into full swing. It may take until we've got through the critical corn pollination month of July before we see farmers in these same Black Sea areas feeling a bit more confident in their production potential, for them to begin looking to commit to new crop corn sales however. Current new crop corn offers FOB Ukraine are around $205-206/tonne, there's a feeling that this could fall below $200/tonne a bit closer to harvest time. Late in the day the International Grains Council released their June world supply & demand numbers. They forecast the global 2014/15 wheat crop at 699 MMT, a 5 MMT hike on last month's estimate. The world corn crop potential was increased by 8 MMT from last month to 963 MMT, and their first estimate on the global soybean crop next season came in at 300 MMT, a 6% rise compared to 2013/14. 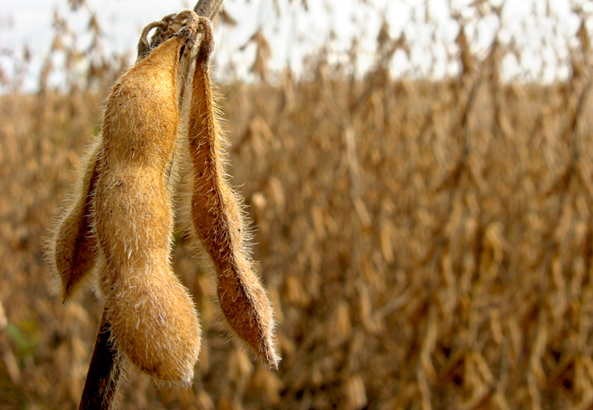 25/06/14 -- Soycomplex: Beans ended with small gains, with all eyes now firmly on the USDA's June plantings and quarterly stocks reports due on Monday. The latter is expected to show the lowest June US soybean stocks since 1977, according to Benson Quinn. Trade estimates for that are in the range of around 340-440 million bushels, with the average guess centred in the region of the 380 million mark. March 1st soybean stocks were 992 million bushels and year ago inventories were 435 million. It is said though that the USDA has come out with a higher stocks figure than the average trade estimate in 5 out of the last 7 years in this report. As far as the acreage report goes, the trade is looking at an average figure of 82.154 million (record high) for soybeans. The range of estimates are 80.5-84.0 million, the USDA's March estimate was 81.493 million and the 2013 acreage was 76.533 million. The average trade guesstimate therefore represents an increase in plantings of 7.3% this year as farmers are drawn to beans by high prices and a favourable bean:corn ratio. Reuters report that the US probably imported around 350 TMT of Brazilian beans in May and that record volumes of Canadian canola are also making their way into the US from Canada. Before we get Monday's USDA reports, we will have Stats Canada's 2014 acreage estimates released on Friday, and prior to that the regular weekly export sales report from the USDA tomorrow. That is expected to show beans sales of around 300-500 TMT skewed in favour of new crop. Old crop soybean sales do keep popping up in these reports though, confounding net cancellation expectations. An Aug sale (which was classed as old crop, although some say it is more likely to be new crop) of 140 TMT to "unknown" announced last week should show up in tomorrow's report. Jul 14 Soybeans closed at $14.15 3/4, up 2 1/4 cents; Nov 14 Soybeans closed at $12.29, up 4 1/2 cents; Jul 14 Soybean Meal closed at $451.70, up $3.30; Jul 14 Soybean Oil closed at 40.65, down 32 points. Corn: The corn market closed around a cent or two lower, and traded within a very narrow range. As with soybeans, the trade is looking to Monday's USDA reports for some direction. The average guess for June 1 US corn stocks is 3.722 billion bushels, from within a range of estimates of 3.046-3.950 billion. The USDA's March 1 corn stocks were 7.006 billion bushels and June 1, 2013 corn stocks were 2.766 billion. US corn acres in 2014 are expected to come in at around 91.725 million. The range of estimates is 91.0-92.2 million, the USDA's March estimate was 91.691 million and the 2013 corn acreage was 95.365 million. The average guess therefore represents a reduction of 3.8% on last year, although 2013 was a 75-year high. According to a Reuters survey Stats Canada are expected to estimate corn plantings there at an average estimate of 3.236 million acres on Friday, down from a March estimate of 3.369 million, due to persistent cool and wet conditions this spring. The USDA attaché in China said that their corn crop is expected to reach a record high this year. The attaché estimates Chinese 2014/15 corn imports at only 3.0 MMT versus a previous estimate of 4.0 MMT. CNGOIC yesterday pegged the Chinese corn crop at 223.0 MMT up 2.1% from a year ago. They forecast Chinese 2014/14 corn imports at 3.5 MMT, down 12.5% versus this season. China only sold 425 TMT of the 2.7 MMT of corn reserves they had up for auction today. They will hold another sale for 2.3 MMT tomorrow. The ongoing dispute with the US over MIR 162 corn, and the resultant ban on China importing US DDG's continues to cap the upside potential for US corn. Russia's Ag Ministry said that their 2014 corn planted area is 2.7 million hectares versus 2.4 million a year ago. Recent rains have boosted the prospects for Ukraine corn production this year, meaning that output might not be too far behind last year's record levels despite the use of inferior quality seed, some suggest. Trade estimates for tomorrow's weekly export sales report from the USDA are 150-300 TMT of old crop and 200-300 TMT of new crop. The USDA announced 217,400 MT of old crop US corn sold to unknown today, that will be included in next week's report. Jul 14 Corn closed at $4.41, down 2 cents; Sep 14 Corn closed at $4.35 3/4, down 1 cent. Wheat: The wheat market ended mixed, but mostly higher, with Kansas wheat displaying the most strength on continued reports of disappointing winter wheat yields on the Plains. The USDA announced 116 TMT of sorghum sold to unknown, split evenly between old and new crop. US wheat continues to be priced out to all but traditional homes by the impending Black Sea harvest, as highlighted in the weekend's Egyptian tender. Trade estimates for tomorrow's weekly export sales report are a relatively modest 300-500 TMT. Trade estimates for Monday's upcoming US all wheat plantings are averaging out at 55.818 million acres, from within a range of estimates of 54.8-57.0 million. The USDA March estimate was 55.815 million and the 2013 final all wheat acreage was 56.156 million. As you can see, there's not a lot of change expected there. For June 1 stocks, the average trade forecast is 598 million bushels. The range of estimates is 560-633 million, the USDA March 1, 2014 wheat stocks were 1.056 billion and June 1, 2013 wheat stocks were 718 million. Stats Canada's figures on Friday are expected to show a Canadian all wheat area of 24.5 million acres, down versus the April estimate of 24.936 million and versus the 2013 acreage of 26.257 million. The USDA attaché in China estimated the 2014/15 wheat crop there at a record 124.0 MMT. They see China's 2014/15 wheat imports at 3.0 MMT, less than half the 7.0 MMT imported in 2013/14. The Russian Ag Ministry said Russia has finished their spring wheat planting, estimating the area at 13.0 million hectares versus 12.8 million a year ago. They've also planted 8.8 million ha of spring barley. F.O. Licht estimated the EU barley crop at 53 MMT versus 59.6 MMT a year ago, due to reduced spring plantings because the mild European winter meant that wheat suffered less winterkill. They peg European barley demand at about 50 MMT. Jordan cancelled a tender for 100,000 MT of optional origin hard milling wheat for Dec/Jan shipment. Japan seeks 120,000 MT of feed wheat and 200,000 MT of feed barley in a tender for Oct shipment. Jul 14 CBOT Wheat closed at $5.75 1/2, up 4 1/2 cents,; Jul 14 KCBT Wheat closed at $7.14, up 8 1/2 cents; Jul 14 MGEX Wheat closed at $6.73 3/4, down 2 3/4 cents. 25/06/14 -- EU grains closed mixed. Harvest pressure remains, with news that Germany is now cutting winter barley a couple of weeks earlier than normal. The day ended with the erratic Jul 14 London wheat contract up GBP2.00/tonne at GBP139.50/tonne and with the more liquid new crop Nov 14 London wheat closing GBP0.25/tonne higher at GBP137.00/tonne. Trade in the long Nov 15 contract has picked up the past couple of weeks, possibly due to the premium it offers over the nearer by Nov 14 position. The former closed GBP1.75/tonne firmer at GBP144.00/tonne tonight. Nov 14 Paris wheat closed a euro weaker at EUR185.50/tonne, Aug 14 Paris corn was down EUR1.25/tonne at EUR173.25/tonne and Aug 14 Paris rapeseed was EUR2.75/tonne firmer at EUR351.75/tonne. Russia's Ag Ministry said the the country has already harvested more than 1.1 MMT of grains, with yields so far coming in at 3.85 MT/ha, an increase of 4.6% on 3.68 MT/ha a year ago. Ukraine meanwhile has also harvested over 1 MMT of grains off 388k ha, with yields averaging 2.74 MT/ha, up 18% on 2.32 MT/ha at this early stage in 2013. The trade is positioning itself ahead of Monday's upcoming quarterly grain stocks and 2014 planted area estimates from the USDA. Even before the report is released, some are already questioning it's accuracy. "The ponding and localized flooding caused by the recent heavy rains is now casting a shadow over the June Planted Report which will be released on June 30th. The survey for the report was conducted in early June before the heavy rains moved into the northwestern Corn Belt. Therefore, any lost acreage caused by the saturated conditions probably will not be accounted for in the June report," said Dr Cordonnier. Whether it's accurate or not, the trade will still trade these numbers on Monday. As far as wheat is concerned, the 2014 US planted area is expected to be little changed from the 55.8 million acres estimated in March. Before that we will have the Stats Canada 2014 planting estimates released on Friday, with a total wheat acres average estimate of 24.370 million expected versus the March estimate of 24.766 million. The typically "El Nino" weather pattern of cool and wet US and Canadian conditions is giving rise to concerns over spring wheat production in both countries. "Saskatchewan has been hit with very heavy rain receiving more than twice the average rainfall in the past month. Extremely wet conditions have developed in Alberta, east of Edmonton, and scattered areas of Manitoba. Wet field conditions are made worse by cool June temperatures. Spring planting in the Canadian prairies got off to a slow start, due to frozen field conditions following a harsh winter. Thus spring wheat, barley and canola development is running significantly behind schedule. June temperatures have been colder than normal in Saskatchewan, the top farm province, with recurring strong showers and persistent cloudiness," said Martell Crop Projections. The HGCA say however that cooler July temperatures in the US Midwest frequently bring higher corn yields. "US maize crops have got off to a good start, but weather conditions as the crops pass through their reproduction stage (known as ‘silking’), in July, will be critical. "Essentially, over the past ten years, as the temperature level has risen across the US Corn Belt in July, US maize yields have fallen," they said. Martell Crop Projections would appear to concur: "The coolest July on record in 2009 did strongly influence corn production leading to a record high yield," they said. The pound remains slightly off it's recent multi-year highs. Yet sterling has climbed from a three-year low of $1.48 early last July, around a week after new BOE governor Carney took office, to $1.70 in the last few days. That's a rise of nearly 15% on the outlook that they will be the first major central bank to raise global interest rates towards the end of the year. 24/06/14 -- Soycomplex: Beans closed lower, in Turnaround Tuesday style. Profit-taking and book-squaring ahead of Monday's acreage and stocks numbers from the USDA may have been a feature. Monday is also first notice day on the July future, and remaining spec longs won't want to be getting caught having to take delivery. Benson Quinn suggest that there is "little incentive by the speculator to trade the August or Sept contracts due to low volume," so that they may now be forced to look at the more liquid Nov 14 new crop future if they wish to continue to participate in the soybean pit. That's a whole different kettle of fish to speculating on the old crop, as we could/should have a record large US soybean crop already in the bin by then. We may be staring down the barrel of potentially record Brazilian (and maybe even Argentine also) plantings also. Another bearish factor was the news that China only sold 44,741 MT, or 12.6%, of the 354,726 MT of soybeans it had up for auction today. Last night's news that US soybean good/excellent crop conditions had fallen by one percentage point to 72% was also seen as bearish, as a 2-3% cut was what the market was expecting. Dr Cordonnier left his 2014 US bean yield estimate unchanged at 45.0 bu/acre, but said that he may lower this if the current wet and cool conditions continue much longer. Jul 14 Soybeans closed at $14.13 1/2, down 11 1/4 cents; Nov 14 Soybeans closed at $12.24 1/2, down 9 1/4 cents; Jul 14 Soybean Meal closed at $448.40, down $7.40; Jul 14 Soybean Oil closed at 40.97, up 29 points. Corn: The corn market ended 1-2 cents lower. Yesterday's cut of 2 percentage points to 74% good to excellent for the 2014 US corn crop was not as bad as some had feared. It was also better than 65% good to excellent a year ago and 68% for the five year average at this time. China are seen producing more corn, and importing less of it, in 2014/15. CNGOIC pegged the Chinese corn planted area at 36.7 million hectares, up 1.1% from a year ago. They see production at 223.0 MMT up 2.1% from a year ago. They forecast Chinese 2014/14 corn imports at only 3.5 MMT, down 12.5% versus this season. Chinese corn demand was estimated at 194.0 MMT, up 3.8% from a year ago but well below the forecast level of production. The Chinese government are to attempt to auction 5 MMT of corn from reserves over the next couple of days. 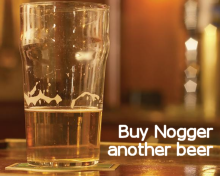 A similar auction last week met with only a tepid response. Dr Cordonnier left his 2014 US corn yield estimate unchanged at 165.0 bu/acre. Benson Quinn report that US DDG's prices have fallen by $100/ton since China said it was banning their import from the US on GMO concerns. "New export markets for DDG's could develop at cheaper values, but right now they’re a cheap alternative to corn and in most cases meal in the domestic market," they said. Taiwan Sugar Corp are said to be tendering for 20,000 MT of US corn for August shipment. Jul 14 Corn closed at $4.43, down 1 1/2 cents; Sep 14 Corn closed at $4.36 3/4, down 2 1/4 cents. Wheat: The wheat market closed around 8-9 cents lower across the three exchanges. Fresh news was lacking, and the path of least resistance remains lower. Chicago wheat was last this low back in early February, prior to the Crimea-led fund buying spree. CNGOIC forecast China's 2014/15 wheat output at 122.5 MMT, up 0.5% from a year ago. Brazil said that they will scrap the usual 10% import duty on wheat bought from outside the Mercosur trade bloc to allow up to 1 MMT of imports by Aug 15. They've been big buyers of US wheat over the last 12 months after last year's poor wheat production year in South America. That could all change in 2014/15 though, with a much larger wheat planted area in both Brazil and Argentina. The wheat harvest in Brazil normally begins on October, and in Argentina it's a month later. Various trade forecasts continue to suggest a bumper wheat production year in Europe, although there are some dryness concerns in parts of France. Bulgaria and Romania face the opposite problem, it's too wet. That will delay the harvest there at the very least, but may also take the shine off yields and quality. Russia’s Ag Ministry said that the country has exported 25.7 MMT of grain between July 1 – June 20th, including 18.2 MMT of wheat. Jordan retendered for 100,000 MT of optional origin barley for Dec/Jan shipment. Algeria bought 200,000 MT of optional origin durum wheat (thought possibly from Canada, Mexico and/or France) for Oct-Nov shipment. Jul 14 CBOT Wheat closed at $5.71, down 8 3/4 cents; Jul 14 KCBT Wheat closed at $7.05 1/2, down 8 1/2 cents; Jul 14 MGEX Wheat closed at $6.76 1/2, down 8 3/4 cents. 24/06/14 -- EU grains closed in the red, reverting to the dominant downwards trend after a modest attempt at consolidation and a bit of short-covering/profit-taking in recent days. The day ended with Jul 14 London wheat down GBP4.00/tonne at GBP140.00/tonne, and with new crop Nov 14 GBP1.75/tonne lower at GBP136.75tonne. Nov 14 Paris wheat fell EUR2.00/tonne to EUR186.50/tonne, Aug 14 Paris corn was down EUR1.00/tonne to EUR174.50/tonne and Aug 14 Paris rapeseed finished EUR1.50/tonne weaker at EUR349.00/tonne. The combines are already rolling in Russia and Ukraine, harvesting mostly barley, but also a small volume of new crop winter wheat. They will soon be harvesting wheat in earnest. Ukraine said yesterday that growers there had already cut over 300k ha of winter grains, producing 839 TMT of new crop grain so far. Most of that is winter barley (813 TMT), although some winter wheat (25 TMT) has also been cut. Ukraine's 2013/14 grain exports meanwhile now stand at in excess of 32 MMT (record), including over 20 MMT of corn and in excess of 9 MMT of wheat, with just a week of the old campaign left remaining. They are expected to harvest another big crop, and remain an aggressive exporter, again this year. A recent Reuters survey placed the 2014/15 Ukraine grain crop at an average guess of 59 MMT (versus 63 MMT last year), and with exports almost matching this season at 31 MMT. Russia is also still busy exporting. Rusagrotrans raised their forecast of Russian grain exports in June to 700-800 TMT from a previous estimate of 500-600 TMT. Russian grain exports this season are expected to finish at around 25.5 MMT, rising to 27.5 MMT in 2014/15 according to the same Reuters survey referred to earlier. Russian spring grain planting is just about finished, with 13 million hectares of wheat, 8.8 million ha of barley and 2.7 million ha of corn now sown. Russian growers have also planted 963k ha of spring rapeseed, which is 88% of the government forecast. 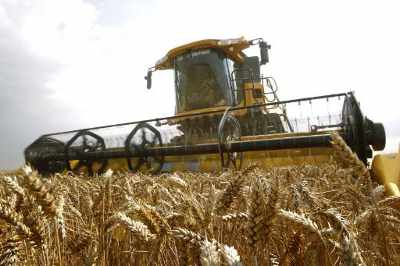 Egypt said that they've bought 3.7 MMT of wheat on the domestic market so far, from their newly harvested 2014 crop. That, along with existing tender purchases leaves the government with 6 months worth of requirements in hand, they said. The pound traded off the recent multi-year highs of over 1.25 against the euro and 1.70 versus the US dollar, although further sterling appreciation is still expected in the second half of 2014, hurting UK export prospects. 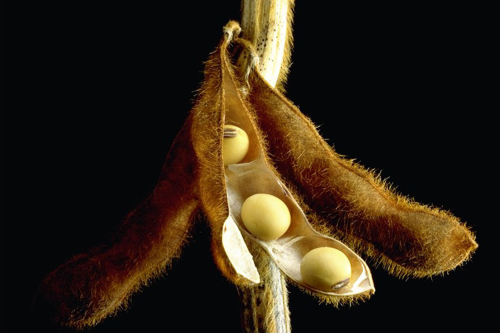 23/06/14 -- Soycomplex: Beans closed higher, with the best gains on the nearby months. Weekly export inspections of only 61,847 MT were poor, but they don't need to be large with the USDA target for the season already well within sight. Chinese customs data shows that they imported 5.97 MMT of soybeans in May, up 17% from a year ago. The vast majority (5.32 MMT) came from Brazil, with only 652 TMT originating from the US. They also imported 651 TMT of rapeseed, up 38% on a year ago. That takes Jan/May bean imports to 27.8 MMT, a 35% rise on the same period in 2013, of which 10.3 MMT came from Brazil and 16.9 MMT from the US. Cumulative year-to-date rapeseed imports are over 2.3 MMT, a 42% rise versus the same period in 2013. Oil World estimated 2014/15 global soybean output at a record 301.9 MMT versus a previous estimate of 301.2 MMT and up 6.3% from 284.1 MMT a year ago. They see global rapeseed output at 68.6 MMT, up from a previous estimate of 68.3 MMT, but down a little on 69.7 MMT a year ago. After the close the USDA said that 95% of the US 2014 soybean crop is now planted versus 92% last week, 91% a year ago and 94 % for the 5-year average. Emergence is at 90% versus 83% last week, 79% a year ago, and 3 points ahead of normal. Crop conditions fell one point from last week to 72% good/excellent, ahead of 65% a year ago. Jul 14 Soybeans closed at $14.24 3/4, up 9 cents; Nov 14 Soybeans closed at $12.33 3/4, up 2 1/4 cents; Jul 14 Soybean Meal closed at $455.80, down $3.40; Jul 14 Soybean Oil closed at 40.68, up 55 points. Corn: The corn market started higher, but quickly gave up the ghost, closing near session lows with losses of around 8-9 cents. Weekly export inspections of 987,936 MT were decent enough, and in line with trade expectations. The marketing year-to-date total is now just shy of 37 MMT. 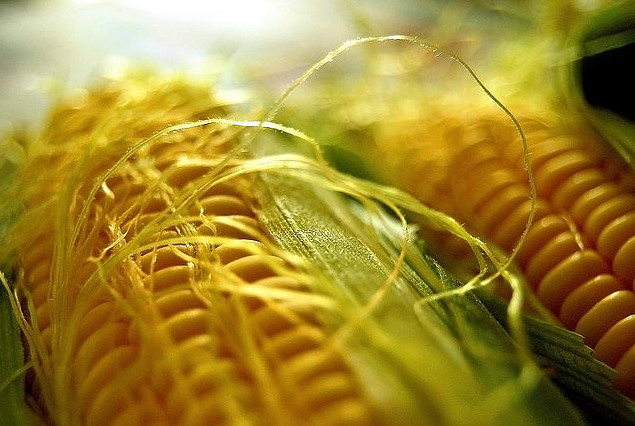 China said that they'd imported just 79 TMT of corn in May. Year to date imports are 1.35 MMT, a near 11% decline on a year ago. The Chinese government is to attempt to auction off another 5 MMT of it's estimated huge 150 MMT surplus corn stocks this week. Last week's auction met with only a lukewarm response, with less than 1 MMT of the 5 MMT on offer actually sold. The USDA cut their corn good/excellent crop ratings by 2 percentage points to 74%. Last week's ratings were said to be the highest in 20 years, so a 2 point drop is hardly a disaster at this stage. Good/excellent a year ago at this time was 65%. The worst conditions are in Kansas where 51% of the crop is rated good/excellent and 10% already poor/very poor. North Dakota has the best corn crop conditions, with 85% of the crop rated good/excellent. Several states are around the 80% good/excellent mark including some leading producers like Iowa, Illinois and Ohio. Recent rains in Ukraine are said to likely be beneficial to newly planted corn there, where they are expecting their second largest crop ever, despite their various troubles. Ukraine new crop corn is said to be offered around $206 FOB the Black Sea. South Africa's CEC are expected to raise their forecast for corn production there this year to around 13.6 MMT, according to a Reuters survey. Anything over 13 MMT will be a 33 year high, they say. Fund selling was estimated at around a net 8-10,000 lots. Jul 14 Corn closed at $4.44 1/2, down 8 3/4 cents; Sep 14 Corn closed at $4.39, down 9 1/4 cents. Wheat: The wheat market closed lower, with an attempt to rally soon fizzling out. Weakness in corn offered no support. Weekly export inspections of 581,483 MT were decent enough though. News that Egypt and Saudi Arabia bought wheat over the weekend was supportive, at least they are buying somebody's wheat, even if it isn't necessarily coming from the US. North America was an accepted origin in the Saudi tender. In the Egyptian tender US wheat was comfortably out-priced, even on an FOB basis before more expensive freight was added on. Chinese customs data shows them importing 226 TMT in May, a 20% decline on a year ago. Nevertheless, they've still imported 2.44 MMT of wheat so far this calendar year, more than double the volume shipped in during Jan-May 2013. The Ukraine Ag Ministry said that Ukraine farmers have harvested 839,000 MT of grain off 306,000 hectares so far. Most of that is barley, although 25,000 MT is new crop wheat. Agritel said that Ukraine wheat prices had fallen 10% last week, which should enable exporters to offer new crop at around $240-245 FOB. SovEcon said that Russian FOB wheat prices on the Black Sea were down to $248-253 from $257-263 a week ago. IKAR said that Russian new crop barley prices were down $5/tonne on last week to around $217 FOB the Black Sea. The USDA said that the 2014 US winter wheat was 33% harvested, up from 16% a week ago and 2 points more than the 5-year average. Winter wheat good/excellent was unchanged on last week at 35%, which is 2 points behind year ago levels. Spring wheat emergence in 98% versus 95% on average. Spring wheat headed is 10% versus 16% normally. Spring wheat rated good/excellent is 71%, down a point on last week but one point more than a year ago at this time. Jul 14 CBOT Wheat closed at $5.79 3/4, down 5 1/2 cents; Jul 14 KCBT Wheat closed at $7.14, down 6 3/4 cents; Jul 14 MGEX Wheat closed at $6.85 1/4, down 5 1/4 cents. 23/06/14 -- EU grains markets began the week mostly higher, on ideas that current low wheat prices are stimulating demand, and on continued weather-related concerns for the US crop. The day ended with the thinly traded Jul 14 London wheat up GBP4.50/tonne at GBP144.00/tonne, and with new crop Nov 14 London wheat GBP0.15/tonne higher at GBP138.50/tonne. Nov 14 Paris wheat ended EUR0.25/tonne firmer at EUR188.50/tonne, Aug 14 Paris corn was down EUR0.50/tonne at EUR175.50/tonne, whilst Aug 14 Paris rapeseed fell EUR2.75/tonne to EUR350.50/tonne. Heavy rains across the US Midwest and Plains continue to disrupt the harvest and are potentially causing yield and quality losses. Fusarium is said to be a problem in the Midwest. Egypt's GASC bought 180 TMT of wheat for Aug 1-10 shipment over the weekend, with 120 TMT coming from Romania and the remaining 60 TMT cargo from Russia. The prices paid were around the $252/tonne mark on an FOB basis, with a further $10/tonne or so on top for freight. The cheapest French offer was $257.69/tonne, and freight from there would also have been more expensive, potentially putting French wheat around $10/tonne over the competition on a C&F basis. US wheat was offered at $264/tonne plus almost $28 freight, making them out-priced to the tune of around $30/tonne C&F on a delivered basis. Saudi Arabia also bought wheat over the weekend, picking up a 780 TMT mixture of hard and soft wheat for Sep/Nov shipment. Europe, North and South America and Australia were the approved origins, although the breakdown of what they actually bought has not been revealed. For today at least, that was enough to support the market, although neither tender purchase was particularly unusual or outrageously large compared with the volumes that you would expect either country to normally buy. Despite the slightly firmer tone, French wheat continues to struggle to get back up above the EUR190/tonne mark on front month Nov 14, and remains within sight of the recent closing low of EUR186.75/tonne set last Tuesday. Coceral put some flesh on the bones of their EU crop production estimates released on Friday. Europe's second highest wheat crop in history will include a near 1 MMT rise in the size of the French wheat crop to 37.7 MMT, along with a more than 600 TMT increase in Germany, where this year's soft wheat crop will total nearly 25.5 MMT. The UK meanwhile, with see production rise by 31% to 15.6 MMT. Wheat yields here will average 7.9 MT/ha, up 7% on last year, they said. That sits in between last week's forecasts from MARS (8.05 MT/ha) and Copa Cogeca who gave us a low looking 7.5 MT/ha. For barley, Coceral forecast a UK crop of 6 MMT, which is 14% down on last year's unusually high output. Yields are seen 4% lower at 5.83 MT/ha. The UK will also produced 2.5 MMT of rapeseed this year, a 14% rise on a year ago, with yields up 15% to 3.45 MT/ha. Again, their yield estimates are in the middle of the range forecast by MARS and Copa Cogeca last week. Flood damage and heavy rains mean that Bulgaria's wheat crop might not make the official forecast of 5 MMT after all, the Ag Ministry there said today. Coceral's Friday estimate was 5.09 MMT. APK Inform said that Ukraine seaports shipped 201.4 TMT of grains last week, a small decline on the 214.3 TMT exported the previous week. Some 94.4 TMT of last week's total was wheat, they added. Agritel said that new crop wheat prices in Ukraine fell 10% last week, as the harvest approaches (a very small volume of wheat has in fact already been cut). That takes local prices down to the equivalent of only $170-186/tonne they said. You won't require a calculator to work out what that means in sterling terms at the low end of that range, with the pound now running at 1.70 against the dollar. Sterling continues to be supported by the belief that UK interest rates will be on the rise long before those in the Eurozone or US. A leading member of the ECB's Governing Council was apparently quoted over the weekend as saying that interest rates in the Eurozone are unlikely to rise before 2016. US rates are also expected to remain where they are at least until the end of 2015. Yet the market is now pricing in a UK rate rise before the end of the year.